– Between 24 — 25 million small businesses in America right now are not effectively selling online. - Many have websites, but they are simply “brochure-ware” sites that act as liabilities and not assets. - Far too many small businesses still hold to the paradigm that it’s all about their business first and their product/service second. In the world of eCommerce, this simply doesn’t cut it. Consumers are looking for products and services…not businesses. We embrace this concept! Think Local :: Sell Global!™ is the philosophy of Local Marketplace™. We are redefining how Small Business America can collectively harness the Web as “The Great Equalizer.” We use the hundreds of thousands of products and services available within any city to create vast Virtual City Networks. Currently, “Small Business America” does not have an effective tool or process to effectively sell their products or services online while marketing their local city. Redefining shopping locally brings in customers virtually first, then physically into their respective stores. Small Business America will be the driving force for the economic recovery and to bring sustainability to the forefront by improving business processes and profitability. There is nothing “Greener” than electronic commerce & viability of the 3Ps: Profit, People, and Planet. What merchants think is local and many lack the funds or people to manage technology systems. The merchants have to be engaged to embrace but also be enlightened at the same time that in Web 2.0 first it is ALL about products and services…not business first. Small business owners are often the biggest obstacle in completing a sale online. We aim to change that! Companies like Reach Local, Merchant Circle and CitySearch are wonderful for promoting businesses, but in the end they are essentially walking potential customers right up the *virtual* front doors…then they walk away! Why don’t they complete the sale? Far too many small businesses still hold to the paradigm that it’s all about their business first and their product/service second…this simply doesn’t cut it. In the world of eCommerce and Web 2.0 it is all about transactions for cash flow. Consumers are looking for products and services…not businesses. We embrace this concept! The current large players are essentially missing this hugely untapped market of 24-25 million small businesses and the hundreds of millions of products and services available for sale… not just available for promotion or social media. Small businesses are walking potential customers to the virtual front doors of these merchants and then they are walking away. We will close the sale for the merchants. Think Local :: Sell GlobalTM is the philosophy of Local Marketplace™, we are “changemakers” redefining how Small Business America can collectively harness the Web as “The Great Equalizer.” We use the hundreds of thousands of products and services available within any city to create vast Virtual City Networks. We have a provisional patent application registered with the USPTO: “Online Local or Regional or Neighborhood or City or County or State e-Commerce Marketplaces” for competitive advantage. The proof of concept model is Auburn-Marketplace.com, a fully transactional, city marketplace where Auburn Californian Merchants are selling their products and services, while marketing their city. Our goal is to provide small businesses a lower cost – between 4.1 – 5.1 percent of each transaction. These merchants have been left behind and we’re going to empower them with the great equalizer – extreme SEO and a built-in social media platform. Each and every product and service within the marketplace will be optimized and not only will each of these bring sales to each merchant, but they will also help market their attendant local cities. We have an official deal in place with the California Board of Equalization whereby we can accept funds on behalf of merchants and not be taxed for it. We will help bring this economy back on its feet by correctly collecting taxes on each and every sale – if the if the merchant has established nexus within the attendant marketplace state. Savvy merchants are creating jobs for themselves by offering to input “timid” merchants (and they are advertising these services on the marketplace itself). - we bring in tax revenues (unlike Amazon or eBay, which make it easy for people to “ignore” taxation. 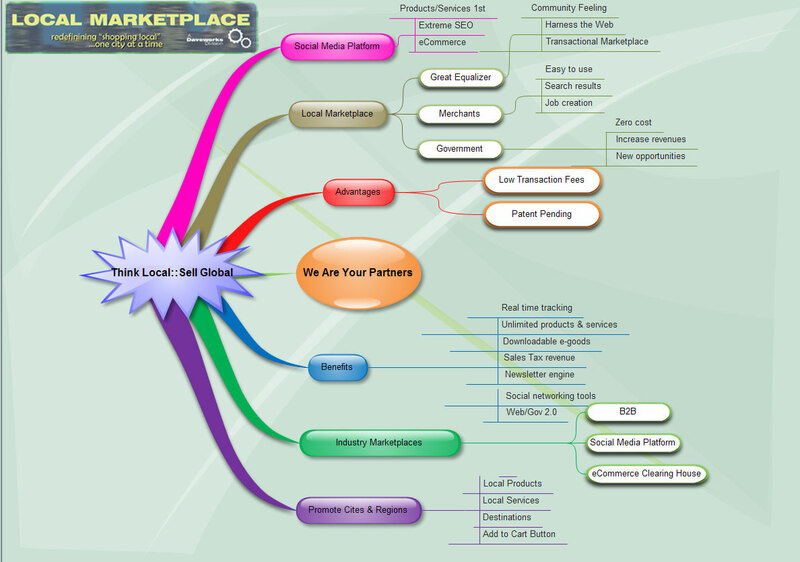 Local-Marketplace.com is an easy to use, but very advanced Online City Marketplace System that allows Merchants to sell their products and services collectively WHILE MARKETING Their CITY to the rest of the world! This Do-it-Yourself System delivers TREMENDOUS Search Engine Results to products and services. There is No need to have website of your own or be technical (very simple to use). Local Marketplace delivers NEW customers from around the globe “virtually” first, then ultimately to the stores. We get paid when you get paid! (*after initial membership fee). Charitable events marketed and sold through Local-Marketplace.com will be processed and our commissions will be waived (after credit card fees and taxes). We provide Small Business America with the great equalizer, The WEB. Introducing the first fully “transactional” Online City Marketplace. We deliver new revenues and secure higher placement search (SEO) results than Fortune 100 companies receive for their products and services. Our solution serves a need not addressed by eBay or Amazon. We provide small business with competitive advantage of social media, networking on steroids. We want to prove and show you how your investment (we become your collaborating partners) in Local Marketplace™ will be the right one to drive business performance, productivity, profitability, and provide you the ability to enhance your business image. 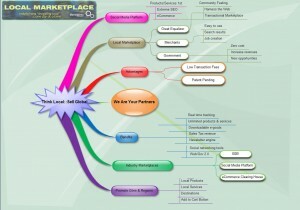 Local Marketplace™, a division of Daveworks Inc.